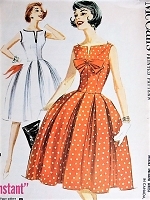 McCall's 5812; ©1961; Misses' and Junior Dress with Slim or Pleated Skirt "Easy To Sew". Raglan sleeve dress with dart fitted bodice and three-gore slim skirt or four-gore box pleated skirt. Slim skirt has folds at front, darts and low pleat at back, may be lined. Sleeves are two-piece; notch detail at front of round neck. Center back zipper closing. Optional decorative stitching on raglan seams and neck.